The New Zealand entry garden at the Pacific Connections Meadow. The Arboretum Foundation is conducting a multi-year, multi-phased campaign to help fund the Arboretum’s comprehensive Master Plan, adopted in 2001. Implementing the Plan will take twenty or more years and require an estimated $60+ million in private and public funding support. The current education “classroom” in the Big Greenhouse — proposed site for the new education center. In the fall of 2016, the Foundation and UW Botanic Gardens kicked off a quiet campaign to raise the funds needed to complete an in-depth pre-design study for the construction of a new environmental education center at the Arboretum. The center fits within the framework of the 2001 Arboretum Master Plan and is the dream of late UWBG director Sarah Reichard. The Arboretum’s education programs serve about 9,800 kids a year. 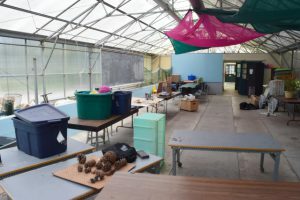 The Master Plan set the goal of doubling that number, and demand for our educational programming is high; however, the old horticulture buildings that support the programs are cramped, poorly heated, and ill-fitted to their current use. With a new education-focused space, we could welcome many more students from diverse communities across the region. By the end of summer 2017, our campaign had raised more than $250,000. In early 2018, we hired the architectural firm Mithun to complete the pre-design study. The firm will provide us with critical information that we need to define the scope of the project, including preliminary concept designs, building cost estimates and timelines, permitting requirements, and parking needs. We should have the study report in fall 2018. Thanks to all our generous donors! More info: Visit the Seattle Parks and Recreation project page for the pre-design study. Make a gift in support of capital project improvements at the Arboretum. To learn more, please contact our Interim Executive Director, Jane Stonecipher, at jstonecipher@arboretumfoundation.org or 206-325-4510.